The United States Geological Service, or USGS, produces the most detailed maps available, such as the 7.5-minute series topographic maps at a 1:20,000 scale. Nor is the USGS planet-bound—their expertise extends to detailed maps of the Moon, Mars, and Venus. Antarctica has nearly 90% of the ice and 70% of the freshwater on Earth. The third-largest continent, it is one and a half the size of the US. Nations including the United States, Britain, Australia, New Zealand, France and Argentina carry out experiments at bases dotted across the continent. ALH 84001 was found in Antarctica during the 1984-1985 Antarctic summer. It was found by a team of meteorite hunters from the ANSMET program, which is sponsored by the Polar Programs Office of the U.S. National Science Foundation. ANSMET stands for ANtarctic Search for METeorites, and has been funded since 1977 by the NSF. It is nearly certain that ALH 84001 is from Mars, even though people have never been to Mars and no rocks have ever been collected on Mars. In fact, there are 11 other meteorites, called the SNCs, that are also almost certain to be from Mars. The strongest evidence for their Martian origin is that they, including ALH 84001, contain traces of gas that is just like the Martian atmosphere. We know the composition of the Martian atmosphere, because the Viking Lander spacecraft analyzed it, on Mars, in 1976. The Martian atmosphere is really different from the Earth’s atmosphere, or Venus’, or any other source of gas that has ever been found. To get off Mars, ALH84001 must have left its surface going faster than Mars’ escape velocity, about 5 kilometers per second (about 11,000 miles per hour). The only known natural process that can get rocks moving so fast is meteorite impact–volcanoes can not throw rocks fast enough. If a large enough meteorite or asteroid hit Mars, some rocks nearby on Mars’ surface would be blasted up faster than the escape velocity and could leave Mars completely. The best estimates are that an asteroid bigger than about 1/2-2 kilometers could launch rocks like ALH 84001 off Mars and into space. After it left Mars, ALH 84001 orbited the Sun on its own, like a small asteroid. It started out with an orbit nearly like Mars’. But its orbit changed each time it passed close to Mars or collided with an asteroid. Also, gravity from the planets (especially from enormous Jupiter) slowly nudged ALH 84001 farther and farther from Mars. By chance, the orbit of ALH 84001 changed enough so that it came near the Earth’s orbit. 13,000 years ago, the Earth and ALH 84001 collided. This leaves unanswered the question of how this rock crossed 52 million miles of space and arrived on Earth. Maybe a UFO landed on Mars, and the rock became lodged in its landing gear. Later, as the saucer was making its final approach into an alien base in Antarctica, the rock came loose and landed in the ice field. In short, the rock came to Earth the same way the dandelion came to North America–by ship. Reflecting on the situation, I thought that the changes on the seventh continent are so few that they hardly justify the creation of new maps. If someone desperately needed a map of the South Pole, it would suffice to resort to a National Geographic map or to the nearest Rand McNally atlas. But could the polar conspiracy theorists be onto something? The matter of polar cartography was soon forgotten—at least for me—until in 1999, the media trumpeted news of a truly sensational discovery: a lake whose waters had never seen the light of day, at least not for millions of years, a few miles beneath the polar icecap. The new body of water was christened with the name of the Russian experimental station located immediately above it: Vostok. In September 1999, a total of 80 scientists from over a dozen countries met at Cambridge University’s Lucy Cavendish College to establish protocols for researching the alleged life forms teeming in what must surely be the blackest waters in the world. In a series of press releases, the assembled scientists reported that the new lake’s micro organisms would have been isolated from the rest of the world for millions of years and therefore represented a possible source of new antibiotics and enzymes. However, undeterred by their colleague, the scientists gathered at Cambridge drew up an ambitious research program for Lake Vostok, including the precautions to be taken to avoid sullying the pristine waters of the hidden polar lake. The use of a “cryobot” was suggested: a ten-foot long device resembling a writing implement with a hot tip. The cryobot would descend the four miles separating the polar surface and the lake and, upon reaching Lake Vostok, would launch a sonar and camera-equipped “hydrobot” to explore the liquid environment. During the ’70s, Russian scientists had managed to drill to a depth of 3,600 meters, almost reaching the lake, whose existence was still unsuspected. Ice-core samples proved the existence of methane—the predominant gas in the atmosphere of distant Europa. Scientists and laypersons alike were thrilled by the discovery and its space-related implications, but Lake Vostok was never mentioned again outside specialized circles…until now. But Antarctica always manages to escape the confines of textbooks and appears to be bent on haunting works of fiction. The errant seaman of Coleridge’s Rime of the Ancient Mariner finds himself in an Antarctic realm filled with ghosts, while master horror writer H. P. Lovecraft, author of “At the Mountains of Madness,” describes the polar journey made by a scientific expedition. The trek results in the discovery of an unknown mountain range that conceals the existence of a nameless, ancient city built by the “Old Ones.” This primeval, non-human species met its end at the tentacles of its own creations: the huge and terrifying Shoggoths. It is precisely in Lovecraft’s works that the purely fantastic becomes uncomfortably mixed with the factual, leading us to confront other polar mysteries of an equally ambiguous nature. Foremost among these is Nazi Germany’s expedition to conquer “Neuschwabenland,” or what had formerly been known as Queen Maud’s Land on most maps. The expedition and its goals have been the crucible for all manner of theories—each more outrageous than the last—regarding intra-terrestrial empires, Nazi flying saucers, and the successful creation of “supermen” in hidden polar bases. Conspiracy theorists seek to bolster their speculation by referring to the sudden display of U.S. military force in the South Pole in the years following World War II, with the supposed aim of combating the forces defending the last Nazi stronghold. Possibly inspired by this assortment of sources, belief in Atlantis has also found a new “lost continent” in which to nestle itself. After 17 years of intense research, British authors Rand and Rose Flem-Ath completed a work entitled When the Sky Fell (Toronto: Stoddart, 1995). Their book did not seek to ascertain the location of the allegedly sunken continent, but rather of other lands where the survivors of such a catastrophe would have sought shelter. The Flem-Ath’s studies led them to select two regions in separate continents: the environs of Lake Titicaca in the Bolivian highlands and Ethiopia’s Lake Tana, suggesting that both of these areas were particularly suited for the reintroduction of agricultural techniques in the wake of a planetary disaster. Graham Hancock, author of Fingerprints of the Gods (New York: Crown, 1995), has joined the Flem-Aths and other authors in supporting controversial scientific theories regarding the displacement of tectonic plates. As regards Antarctica, the theory suggests that the southernmost continent was located north of the present Antarctic Circle and could have been inhabited, featuring “a climate and resources suitable for the development of a civilization.” Could these researchers have solved the riddle of the mother culture we have come to identify with Plato’s Atlantis? Whether Atlantis was located in Antarctica or not, it is worth bearing in mind the prophecies issued by Edgar Cayce, the “Sleeping Prophet.” Aside from performing a number of cures while in a trance state, Cayce also gave us a series of readings regarding Atlantis which are studied to this very day. One of them made mention of an enormous crystal allegedly employed by the Atlanteans as a source of energy. Cayce predicted that said object would be rediscovered in the late 20th century, but without specifying its location. If the Sleeping Prophet’s prophecies coincide with the theories put forth by the Flem-Aths and Graham Hancock, could the Lake Vostok anomaly be connected to the lost power source of the ancient Atlanteans? Early research into Lake Vostok indicated that the body of water had a depth of 2,000 feet—far deeper than any of the Great Lakes and half as deep as Asia’s Lake Baikal (5,000 feet)—a length of 300 miles and a width of 50 miles. Contrary to what was initially believed, the lake received filtered light. Further investigations also detected the existence of geothermal sources which warmed the lake to an astonishing 50 degrees Fahrenheit, with “hot spots” of up to 65 degrees. Given these new discoveries regarding solar radiation and temperature, scientists suggested the possibility that the lake’s encapsulated atmosphere purified itself through a complex interaction with water, and that the chances for vegetable life forms were very good. 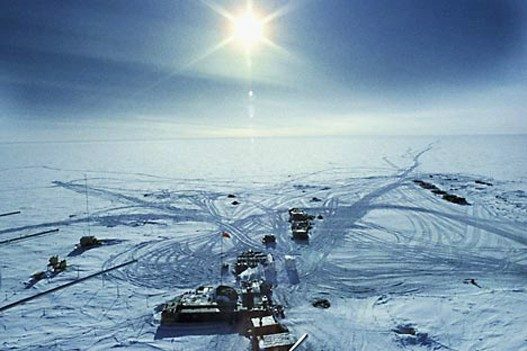 Research conducted by Russian scientist Ian Toskovoi—who vanished near the Vostok station in March 2000—on “geothermal upboiling” also hinted at an alternative means of purification and replenishment for the subterranean lake’s atmosphere. Toskovoi’s geothermal upboils were located in the so-called “ice dunes,” which appear to be formed by thousands of bubbles of air measuring between several feet to several hundred feet. The electronic newspaper Antarctic Sun (www.polar.org), which soon became the main source of information on the Lake Vostok magnetic anomaly, stated that during the initial flight of the SOAR (Support Office for Aero-physical Research), aimed at conducting magnetic resonance imaging over the area, the magnetometer recorded an increase of 1,000 nanoteslas beyond the 60,000 nanoteslas which characterized the Vostok Station. Scientists had expected to find magnetic anomalies in the range of 500 to 600 nanoteslas in areas where volcanic material could be located, but the ranges encountered were simply startling. “This anomaly is so large that it cannot be the product of a daily change in the magnetic field,” stated Michael Studinger, one of the researchers involved in the mapping endeavor. Using much less technical language, others noted that Mason’s explanation matched the hypothesis suggested by Prof. Thomas Gold in Australia’s Nexus magazine. According to Professor Gold, the amount of methane and exotic gases such as xenon and argon could represent a direct threat to global climate, since they would come directly from the Earth’s mantle using the geological features under Lake Vostok as “chimneys.” Aside from the danger this could represent for our planet’s embattled atmosphere, the teams of scientists and technicians in charge of drilling through the methane dome would be in the first line of danger, since such an operation would likely result in a catastrophic explosion. The lunatic fringe didn’t wait too long before chiming in on the Lake Vostok situation. The most outrageous rumors emanated not from the U.S. but from Australia, where a website (www.rumormill. com/Fortress_Australia) indicated—or ranted, more properly—that the total population of Nazis in Antarctica now exceeded two million and that many of them had undergone plastic surgery in order to move about with greater ease through South America and conduct all manner of business transactions. Conspiracy theorists stoked the fire by saying that the polar Nazis had successfully stolen an intaglio press to forge dollars, in addition to having forged “virtually undetectable” pounds sterling. The monetary needs of the polar Nazi community were further supplemented by “the gold stolen during the war and their ability to transmute base metals into gold.” It was only logical, they argued, that the mystery of Lake Vostok was also directly related to the nefarious activities of the polar Nazis. In early March 2001, a U.S. channeler known as Lady Kadjina replied to a series of questions regarding the mystery of Lake Vostok. Regarding the nature of the magnetic anomaly, she declared that long before the Antarctic became icebound, the continent had been used as a landing site by extraterrestrials. The ever-benevolent aliens built what we would call an observatory, explained the channeler, equipped with a signalling device capable of broadcasting coded messages. More and more such observatories would be discovered in coming months, and Earth governments would try to seize them. Lady Kadjina added that the observatory contained vast crystals which put forth a certain kind of magnetism, which had been employed as a guidance system so that large spaceships could land at that location. But that wasn’t all: the magnetic anomaly also served as a port of entry to other dimensions. Vice-Admiral Byrd had apparently stumbled into one of them and had radioed back reports of seeing a completely different, verdant landscape under his aircraft. With proper knowledge of this equipment, a human being would be able to travel in time and access information stored in distant places. But we will be kept from doing so until our governments have put aside the arms race and reach a more peaceful level of co-existence. This was my second attempt at contacting the protagonist of the extremely bizarre press conference allegedly held by NASA regarding its involvement, or rather, the sudden end of its involvement, in the Lake Vostok project. It appeared that the agency’s budgetary cuts had been so severe that not even background music could be heard while I was on hold. Although I doubted that the elusive Ms. Shingteller would actually return my message, I thought that it was still worth a try. I was surprised, however, when the voice on the answering machine did not correspond to that of the spokesperson, but to another functionary of the NASA Public Information Office. It would appear that Ms. Shingteller had taken some time off after the conference that would make her a household name in conspiracy circles around the world. My question, in any event, was straightforward: why didn’t the press release regarding the sudden distancing of NASA and JPL with the Lake Vostok project appear among the ones publicly available on the web (www.nasa. gov)? Word spread over the Internet that researchers stationed at Norway’s Amundsen base, 150 miles east of Vostok, had witnessed the arrival of a large quantity of equipment and personnel in the study area. Australian sources remarked that the two women who had taken the challenge of crossing Antarctica by skiing from one end to the other had been forcibly evacuated. Apparently both skiers had been transferred to the Australian polar base and from there to Samoa by an elite U.S. Marines unit, despite the protests of Australian personnel. Another rumor held that Russian scientists had been evicted from the Vostok base by U.S. Navy SEALS (what must Vladimir Putin have thought about all this?) while an exodus of personnel from the U.S. bases was underway: Seven individuals, all of them employed by Raytheon, which provides support services for the American polar bases, were evacuated for medical reasons, while another four departed from the McMurdo base voluntarily. According to statements made on the Art Bell Show, two of departees from the South Pole were suffering from an ailment about which they refused to comment. Much was made about a comment voiced by the physician in charge at McMurdo to the medical officer who was coming in to replace him: “Fill your pockets with salt” —apparently a phrase commonly employed in the nuclear industry referring to the taking of iodine tablets in order to prevent any harm to the thyroid gland in the event of a nuclear crisis. Even more startling was a statement posted on the Internet and attributed to Mike Bara, who coordinates the Enterprise Mission’s “South Pole Update.” The statement supposedly suggested that the short supply or complete lack of salt at the South Pole at the end of the Antarctic summer, at a time when sufficient quantities ought to be found after seasonal revictualing, suggested the possibility that the salt was being consumed by workers due to high levels of radioactivity—suggesting the possibility that the source of Lake Vostok’s heat could have been radioactive in nature. In his book Atlantis Rising (Dell, 1976), renowned paranormal and UFO researcher Brad Steiger mentioned a 1965 paper presented by Canadian geophysicist John M. DeLaurier of the Dominion of Canada Observatory. According to this scientist, there was something strange going on beneath the ground at Ellesmere Island, a barren location mostly covered by glacial icecap and roamed by herds of caribou and musk oxen. This farthest southern land has long been a blank slate inviting speculation. In Edgar Allan Poe’s strange novel, The Narrative Of Arthur Gordon Pym Of Nantucket, the adventurer finds that, beyond a certain latitude, the climate begins to get warmer! This echoes claims in a later book, The Hollow Earth, by Dr. Raymond Bernard. Dumbrova, a Russian explorer, is therein quoted as referring to, “The memorable December 12th discovery of heretofore unknown land beyond the South Pole by Capt. Sir George Hubert Wilkins.” F. Amadeo Giannini confirmed “indeterminable land extent” at the South Pole in his suppressed 1959 book, Worlds Beyond The Poles. Building upon Poe’s earlier work, H.P. Lovecraft told a fantastic tale in his, At The Mountains Of Madness. An Antarctic expedition finds a cyclopean lost city dating from before pre-Cambrian times. Two explorers investigating weird hieroglyphics in underground caverns encounter blind, 6-foot tall albino penguins. Unearthed is evidence of a long-gone alien civilization, which had retreated to the polar region. Deep underground, a final discovery drives one of the explorers insane and they both narrowly escape with their lives. Byrd’s remarks are cryptic: do they warn of the need to defend against future weapons technology or against something already present at the time? Iconoclastic magazine editor Ray Palmer commented on discoveries made by Byrd, quoting him as having stated, “We have penetrated an unknown and mysterious land which does not appear on today’s maps.” Again, the statement is either relatively mundane, or it is laced with deeper significance. Return now to the noncommital news that shrinkage of Antarctic glaciers has been accelerating. A blip on the radar screen to many; evidence of environmental problems to some; fraught with potential meaning to a few: Is something cooking there, at the mountains of madness? Piri Re’is own commentary indicates that some of his source maps were from the time of Alexander the Great (332 B.C.).. The Piri Reis map shows that the northern part of that continent has been mapped before the ice did cover it. That should make think it has been mapped million years ago, but that’s impossible since mankind did not exist at that time. He cites a number of old maps, such as the one drawn by Oronteus Finaeus in 1531, reproduced here. Experts examined the original and its age was verified. It was made in the 1500s–three centuries before Antarctica was allegedly even sighted, much less documented. The map is startlingly accurate, depicting ice-free mountain ranges, a South Pole that’s just about dead on and the Ross Sea as it would look without the ice shelf. Hancock’s answer is that it was actually mapped long ago, perhaps thousands of years earlier, and Finaeus merely copied those ancient sources. According to Hapgood’s reconstruction, copies of these documents and some of the original source charts were transferred to other centers of learning, and among them to Constantinople. Then in 1204, year of the fourth crusade, when the Venetians entered Constantinople, those maps begun to circulate among the European sailors. The Hydrographic Office couldn’t believe what they saw: they were even able to correct some errors in the present days maps!! Charles Hapggod, in 1953, wrote a book called “Earth’s shifting crust: a key to some basic problems of earth science”, where he made up a theory to explain how Antarctic had been ice-free until year 4000 BC. The reason Antarctic was ice-free, and therefore much warmer, it is to be found in the fact that, at one time, its location wasn’t the south pole. It was located approximately 2000 miles further north. Hapgood says this “would have put it outside the Antarctic Circle in a temperate or cold temperate climate. The reason why the continent moved down to its present location has to be found in a mechanism called “earth-crust-displacement”. This mechanism, not to be confused with the plate-tectonics or the continental drift, is one whereby the lithosphere, the whole outer crust of the earth “may be displaced at times, moving over the soft inner body, much as the skin of an orange, if it were loose, might shift over the inner part of the orange all in one piece”. Impressive is the “Dulcert’s Portolano”, year 1339, where the latitude of Europe and North Africa is perfect, and the longitudinal coordinates of the Mediterranean and of the Black sea are approximated of half degree. When human beings were supposed to live in a primitive manner, someone “put on paper” the whole geography of the earth. And this common knowledge somehow fell into pieces, then gathered here and there by several people, who had lost though the knowledge, and just copied what they could find in libraries, bazaars, markets and about all kind of places. Writing in Piri Re’is own hand described how he had made the map from a collection of ancient maps, supplemented by charts that were drawn by Columbus himself. 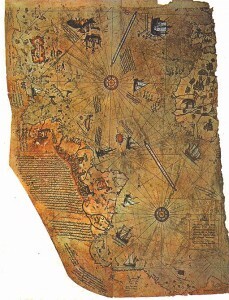 This suggests that these ancient maps were available to Columbus and could have been the basis of his expedition. The “center” of the source map projected from coordinates in what is now Alexandria – the center of culture and home of the world’s oldest and largest library until its destruction by Christian invaders. In 1577, a group of English explorers found a dead unicorn on the western shore of what is now called Baffin Island. They were delighted with their find, even though the giant fish stretched on the beach didn’t resemble the traditional unicorn of folklore. The maps that guided their expedition had prepared them for an Arctic world full of magic and monsters; clearly, the fish on the beach fell into the latter category, and since it possessed a horn, what could it be but a unicorn? However, some of the crew members questioned whether the fish-like “Sea Unicorn” possessed the same qualities as the land variety. A quick-witted sailor devised a test to end the debate: he caught a couple of spiders in the ship’s hold and rammed them into the broken tip of the whale’s horn. The spiders died, to the great delight of the explorers. Here, at the very edge of the known world, they had discovered one of the great treasures of the Elizabethan age: a magical horn that could cure all poisons and bring death to venomous creatures. The Arctic’s fantastic reputation began with the ancient Greeks, who noticed that the “Arktos” constellation (now called the “Great Bear”), circled the northern sky without setting. The Greeks considered this a bizarre way for stars to behave, and they thought that the lands beneath the Arktos constellation were probably as strange as the stars that circled above them. Greeks who collected travelers’ tales about the mysterious northern lands soon determined that the arctic lay above the source of the north wind, and thus enjoyed a pleasant climate. The land was allegedly populated by an equally pleasant race of people, the Hyperboreans. Life in the Arctic was so easy that the Hyperboreans were basically immortal. They spent their lives singing, dancing, and eating. Unfortunately, even paradise has its downside: after about a thousand years of partying, the Hyperboreans had lost all interest in music and food. They strung flowers around their necks and drowned themselves out of sheer boredom. Greek travelers’ tales weren’t just limited to stories about the mass suicide of mythical civilizations, however. Around 330 BC, an astronomer called Pytheas supposedly sailed north of Britain and discovered a land called Thule, where the sun was visible at midnight on the summer solstice. When he tried to sail north of Thule, he encountered an impassable barrier he called the “sea lung” and was forced to turn back. Pytheas added Thule and its dangerous sea lung—thought by modern scholars to be drifting sea ice—to the maps of the ancient world, where it soon passed into legend. For centuries, “Thule” became the shorthand for the mysterious regions of the North, where peculiar sea lungs and Hyperborean paradises awaited bold explorers. Medieval English explorers added their own travels, mixed with a healthy dose of garbled Norse mythology, to the mix. In addition to tropical lands of plenty, the Arctic was soon known as the land of pygmies, and had a coastline plagued by giant whirlpools. 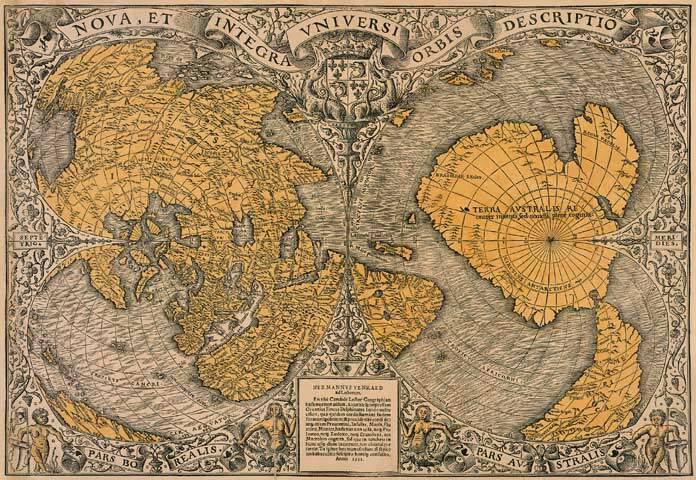 In 1569, Flemish geographer Gerhard Mercator put medieval polar knowledge to work in a very influential map, which depicted not only the complex coastlines of the Open Polar Sea, but also a strange “black rock” that was Mercator claimed stood at the pole itself. 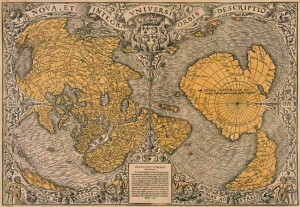 This was the map that guided Elizabethan explorers on their quests into Arctic territories. By the time England launched its 1577 Arctic expedition, the northlands were widely thought to be habitable territory worthy of annexation. Elizabeth I summoned her court astrologer and learned advisor, John Dee, and told him to come up with an argument for British sovereignty in the Arctic. Dee obliged her with a report that dated England’s Arctic claims back to King Arthur. When he wasn’t pulling swords out of stones and dispatching knights to slay dragons, King Arthur apparently mounted expeditions to the Arctic. Dee claimed that Arthur “even unto the North Pole . . . did extend his Jurisdiction: And sent Colonies thither”. Sadly, however, the Elizabethan expeditions failed to profit from their adventures. The crops the sailors planted died in the icy blasts of the Arctic winter, and gold mines they established on Baffin Island produced only useless rock. In hindsight, however, Dee’s “Arthurian” Arctic claim would prove important to world history: it fueled further Elizabethan exploration of the north and helped legitimize English settlement in North America. By the time the next wave of exploration came round, England’s Arthurian claims to the Arctic had fallen by the wayside, but the mystique of the polar regions remained. In 1817 England renewed its Arctic ambitions when whalers’ reports indicated that the icy barrier around the pole was melting. The Admiralty gave Sir John Ross command over the first major English Arctic expedition of the nineteenth century, which set sail from London in April 1818. Although the Ross expedition failed to discover either a Northwest Passage or an Open Polar Sea, discussion surrounding the planning, departure, and subsequent adventures of the expedition reignited English interest in the Arctic. With public interest in the Polar Regions at a new high, fiction-writers stepped in to speculate on what the explorers would find in the north. Mary Shelley’s Frankenstein, arguably the most famous Arctic novel of 1818, begins with the departure of an ill-fated polar expedition. “I try in vain to be persuaded that the pole is the seat of frost and desolation,” Captain Walton declares in the novel’s opening chapter, “I will put some trust in preceding navigators . . . there snow and frost are banished, and sailing over a calm sea, we may be wafted to a land surpassing in wonders and beauty every region hitherto discovered on the habitable globe”. While Walton never does reach the Pole, he does get his share of marvels in the forms of amateur polar-travelers Victor Frankenstein (the original mad scientist) and his murderous Creature. At the end of the novel, Frankenstein’s Creature takes off for the North Pole, supposedly to commit suicide, but Shelley deliberately leaves the monster’s final fate unresolved. While Frankenstein is often credited with being the first science fiction novel, few modern readers realize that its SF elements go far beyond Frankenstein’s corpse-raising experiments. At the time Shelley was writing, English explorers had not yet mounted a modern expedition to the pole, nor had they used dog sleds or the other methods of travel she describes. For all Shelley and her contemporaries knew, the pole could very well be the tropical paradise Walton envisions. But in describing the outer Polar Regions as a desolation of ice best crossed by dog sled, Shelley predicted the future of Arctic exploration with surprising accuracy. With Britain back in the Arctic game, it didn’t take long before America also began to mount expeditions to the polar territories, and American SF authors followed suit. Twenty years after the publication of Frankenstein, a travel narrative appeared claiming to recount the Adventures of Arthur Gordon Pym of Nantucket, a stowaway whose macabre misadventures had landed him on a tropical island in the Open Polar Sea of Antarctica. Chased by cannibals and tormented by the weird cries of strange penguins, Pym made his way to the South Pole, where he was promptly sucked down a giant polar hole into. . . . But here, to everyone’s disappointment, the narrative broke off. Notwithstanding the question of how a manuscript last seen accompanying its author to the center of the earth ended up in the hands of American publishers, some readers considered Pym’s description of the Antarctic plausible enough to warrant a revision of world maps. Unfortunately, Pym’s narrative was actually a work of fiction, invented by an imaginative author by the name of Edgar Allen Poe. Although Pym is not one of Poe’s most famous works, it proved popular enough to survive and inspire other SF authors. H.P. Lovecraft wrote At the Mountains of Madness as a loose sequel to Pym, and his invention of Antarctic “shoggoths” went a long way towards explaining why poor Arthur Gordon Pym was so terrified of penguins. At the time that Lovecraft was writing, the poles had finally been reached and documented, and no tropical islands, gigantic holes, or mysterious “black rock” had been found. But the Polar Regions’ magical reputation proved extraordinarily resilient, and it took on new life with the rise of Nazism. In 1912, a group of German mystics founded the Thule Society. Inspired, perhaps, by Friedrich Nietzsche’s identification of northern supermen with the legendary Hyperboreans of the arctic, the Thule Society traced their order back to the ancient island of Thule. Like Atlantis, this advanced civilization had supposedly perished when the island sank into the ocean, leaving their Aryan descendents stranded on a southern continent populated by Jews and other racially-inferior creatures. Luckily, some of Thule’s secrets were accessible to members of the Thule Society, and they hoped to use their knowledge to re-establish Aryan supremacy over the globe. The Thule Society became a reliable source of the radical recruits who would help Adolf Hitler form the National Socialist Party, and its terminology continues to surface in modern white-supremacist magazines like Thule. Nazism’s connection to the mystical Arctic spaces was revised following the Second World War, when Flying Saucers editor Ray Palmer wrote an article linking the Arctic to the relatively new phenomenon of UFO sightings. Strange as it may seem to those of us raised with the concept of little green men, early discussion of UFOs often assumed that flying saucers and their ilk were the experimental war planes of undefeated Nazis, hiding in some as-yet undetected portion of the globe. The Arctic quickly became a prime candidate in this mythos: after all, if you were Adolf Hitler, where would you hide? South America? Or the traditional dwelling place of racially-superior mystics? Clearly (according to Palmer), the Nazi UFOs were based somewhere in the Arctic. In fact, they were probably hidden inside the giant polar hole described by people like Edgar Allen Poe. This conspiracy theory received a boost with the publication of a “secret log” supposedly kept by Admiral Byrd during his transarctic flight on February 2, 1947. According to the secret log (generally believed to be a hoax), Byrd was forced to land in the tropical Arctic by Nazi flying saucers, and then interrogated by Aryan space aliens, who persuaded him to enter into a conspiracy to protect their secret Arctic paradise. Different versions of this story exist, some of which also include a secret American military operation aimed at wiping out an Antarctic Nazi colony, but in all of them we can see the vestiges of earlier polar legends. Although most speculative fiction writers have preferred alien UFOs to the Nazi variety, Polar Regions have continued to crop up in stories of government conspiracies and hidden spacecraft. In John Carpenter’s The Thing, for example, Antarctic researchers stumble across a UFO frozen in pack ice, and learn too late one of the most important rules of arctic survival: never defrost a UFO you find hidden in pack ice. In The X-Files movie, intrepid FBI agents Mulder and Scully make a similar discovery when they come across a UFO buried in Antarctica, although, being the stars of an ongoing TV series, they manage to survive quite a bit longer than the researchers in The Thing. The tropical aspects of Arctic legends appear far less often in modern speculative fiction. However, Lost, the new, genre-bending TV series that made a splashy debut last season, could possibly be a throwback to the age-old stories of the Hyperborean Arctic. Lost follows the survivors of a plane crash that has left them stranded on a mysterious tropical island patrolled by polar bears and invisible monsters. An old distress signal speaks of a “black rock,” and concrete bunkers hidden in the jungle provide evidence of a possible government conspiracy. Meanwhile, the survivors fear to put a raft to sea in southern winds, for fear of drifting to Antarctica. After reviewing the little information the survivors have gathered about the island, conspiracy theorists and Elizabeathan explorers would probably conclude that they were already in Antarctica, and would be better off staying put. Regardless of whether or not Lost turns out to have anything to do with the Arctic, it seems likely that the Polar Regions will continue to play a role in speculative fiction. Although much of the Arctic’s romance is now overshadowed by the even more remote (and therefore even more mysterious) regions of space, the Arctic provides not only an earth-based location for speculative plotting, but a well-established tradition for authors to draw upon. Spufford, Francis. I May be Some Time: Ice and the English Imagination. New York: St. Martin’s Press 1997. Siobhan Carroll is a doctoral student at Indiana University. Her short stories and poetry have appeared in magazines like On Spec, Room of One’s Own, and Son and Foe.